Home / 2018 / Oh No! Not The New Honda! Oh No! Not The New Honda! During our journey this last summer our Honda EU2000i generator had decided to take the big dirt nap. Necessitating a replacement be shipped to us in Nuka Hiva, Marquesas. 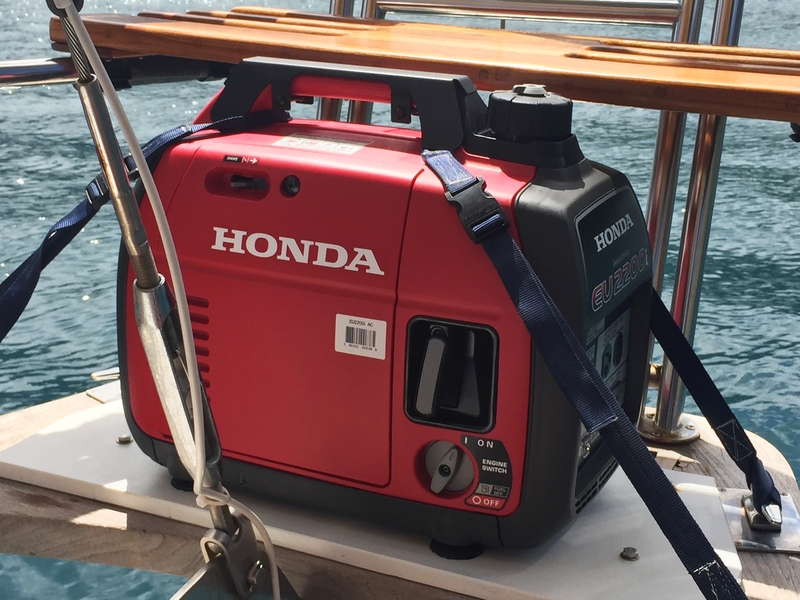 We use the Honda daily to assist in recharging the batteries, making fresh water and occasionally heat the water heater tank. Needles to say we were happy to see the new one arrive before we continued our travels. Wow! I was glad to be able to give the Yanmar engine a rest from charging batteries when needed. It was great having a Honda back online aboard Dazzler. Everything was working well for several months. About a month after going online the pull cord to start the generator started to fray. No trouble, I have plenty of cord onboard. A quick replacement and she was back in business. About a month later the cord started to fray again. Okay, now I’m starting to wonder what’s going on. We were in VaVa U group of the Tonga islands when it happened the second time. No trouble, I would replace the cord with a bite of Spectra cord which should be a bit more abrasion resistant than the nylon cord. After getting Jack put back together, it wouldn’t start. We called the generator Jack, because of all the assistance our friend Jack had done in helping us acquire the new generator. I hadn’t disconnected anything and it had been running that morning before I decided to replace the starting cord. I have to tell you that after taking the end covers and the side covers off and putting them back on more than eight times looking for and diagnosing every wire and the carburetor, I was at my wits end. Still no spark to the spark plug. There are only five electrical components that could be the culprit. Including the wiring harness. I checked each piece for its factory resistance or ohms and everything seamed to be within specifications. If everything is in specs then it could be the sealed electrical spark unit. Nice! I’m usually not a quitter, but this time I was. I didn’t know what else to do. There is no Honda dealer in the Tonga island group to get parts and the closes supply would be New Zealand. Many of the parts on our EU2200i are similar to the EU22i (European model). It is sold and distributed in parts of the world that use 240 volt 50 hertz cycle electricity. We checked into the. Possibility of having a spark unit shipped to us in Tonga which was possible, but extremely cost prohibitive. So, we decided to fire up the Yanmar again and wait for New Zealand. I had checked online and the Spark unit for both model generators was the same part. After arriving in New Zealand, we went to North Coast Honda to order a new Spark unit. A couple of days later it arrived. Imagine my excitement. I rushed back to Dazzler to install the new part and Shazam! It didn’t start. Okay maybe I didn’t get the wiring plug seated properly. Yea that must be it. So, I took the end cover off and re-plugged the wiring harness into place and put the cover back on. Ready…1, 2, 3…no start! WHAT the H E double hockey sticks? Or something like that. There I was removing all the covers again checking everything to no avail. I decided that Honda was going to get the honor of our Honda generator for repair. Once at the shop I explained to the technician what I had done and what had been replaced. The service man was Paul Newman. Who knew he was working at a Honda dealer in Whangarei New Zealand? It’s always the last place you look. HA HA! They accepted it without a service receipt and said they would let me know. Paul did tell me that Honda New Zealand is a private company and not a direct part of Honda global. And although Jack was only four months old they would not be able to provide any warranty service on our unit. Well, Jack was only four months old so I decided to contact Honda USA to see what they would be able to do for me. The first response was “sorry you have to take the generator to one of their service centers”. And because it has had gas and oil in it NO airline would accept it for shipping to the Good ol’ USA. So it either was going to get fixed here or tossed into the trash heap. We needed it. I decided to go to the next level and ask for the supervisor at Honda Equipment Center. Enter John into the picture. I explained to him our situation and although sympathetic to our predicament he did not initially offer any warranty hope. I did provide the Honda service center in New Zealand information to John as he offered to contact them to see if he could be of assistance in determining the problem. To make a long story short, the Honda technician here in New Zealand found the same thing I did as far as the resistance and ohms for each piece of equipment. The spark coil was a little off of specifications. So they decided to replace that first. That didn’t work. They did some more testing and put the spark coil on an EU22i and it worked. Now we are getting somewhere. Well after ordering a new wiring harness provided by John of Honda USA and a few weeks of shipping time it arrived and was installed. Now there was spark, but still not starting. They removed the head and found that the intake valve arm was cracked and the intake valve was frozen in the closed position. Once again with the assistance of John at Honda USA, a technique of freeing the valve without breaking the motor case open was conducted and the valve was free. The Honda dealer had an older Honda generator that they were using for parts, so they robbed the intake valve arm and after putting in some fresh gas…Jackie was alive and running again. The Honda dealer was unable to explain how the valve might have become stuck so I could avoid it in the future. I suspect that after it lost spark in Tonga and then sitting idle for two months had something to do with the stuck valve. When I arrived to pick Jack up and pay for the bill, they gave me the old wiring harness. After returning to Dazzler with a working Jack, I checked the ohms on each wire in the old harness. John had first told me that many times an issue has been a poor ground connection. Hummm, when checking the ground wire, I discovered some interesting readings consistent with a poor connection. Could all of this trouble have been right there all along. Well, we won’t know for sure because there is a new wiring harness in place. But, I’ll put that tidbit of information in the memory banks for future issues and being able to help others that use a Honda generator. A few days later, I fired off an email to John at Honda in the USA thanking him for his assistance to the Kiwis in getting our generator up and running again. I also re-approached the warranty issue with him again. Several days later I received a message to give him a call. He advised that Honda was going to offer a good faith payment for our inconvenience that worked out to be a little less than half the service bill at Honda in New Zealand. Better than a poke in the eye with a stick. I did ask John several questions to help avoid any of these issues in the future. He indicated to always use fresh fuel if possible. Hummmm, fresh gas in the South Pacific might be hard to come by all the time. John also indicated that turning the switch off and pulling on the start cord until you feel resistance will put the crank at top dead center and both valves would be closed. He explained that this should be done when the generator is turned off and it should help aid in preventing stuck valves in the future. I can’t always get fresh fuel in some of our destinations, so we will be looking for a source of gasoline additives to help stabilize the fuel that is stored. I’m not sure this will be the end all, because the Yamaha outboard uses the same fuel and we very rarely have any issues with it. Keep in mind that I regularly service it as well. The bottom line is _________ we will see what happens with Jack’s continued service in the future. Until then once a week Jack is started to keep things lubed up and everything running properly until we get back to the anchorages and needing daily use of Jack. thanks for the insight…happy road travels!! Thanks Brian. Hope they all keep working smoothly!